It’s Monday and no one likes Mondays! In order to help brighten your day below are two events to look forward too this Friday in Downtown West Chester! Every song is fresh. Every scene is new. Every night is different. It’s all improvised musical comedy — and it’s all funny! The New York Times calls Broadway’s Next Hit Musical “Hilarious.” But don’t take their word for it. Come see theater’s best improvisers use song suggestions from the audience and create a spontaneous evening of music, humor, and laughter. The next great American musical will be written in West Chester at the Emilie K. Asplundh Concert Hall. Ticket information at the Department of Cultural & Community Affairs. Enjoy blackjack, craps, and roulette tables while munching hors d’oeuvres and sipping drinks. Everyone will be a winner with tons of door prizes, a Swag Bag for every guest, and knowing you’ll be supporting the “Send A Kid To Camp Fund.” 7:00pm-11:00pm at Milestone Events, 600 E Market St. $40.00 per person or $75.00 per couple. 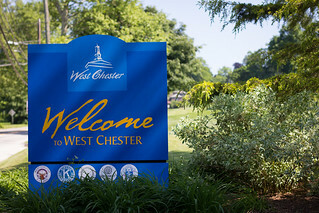 Sponsored by the West Chester Parks & Recreation. Call for a reservation at 610-436-9010.